In stock -This product will ship today if ordered within the next 57 minutes. There are certain times of the year when the immune system may require extra nutritional support. For example in certain seasons pollen or other environmental factors can place extra pressures on the nutritional requirements of both adults and children alike. 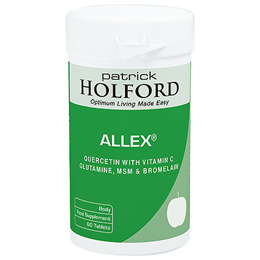 Allex provides essential immune support at these especially demanding times. Allex is made with the intolerant individual in mind and so is completely free from gluten, milk products, yeast, corn, soya or other common allergens. Vitamin C Preparation (Ascorbic Acid with hydroxypropyl methylcellulose), Quercetin, L-glutamine, Methylsulfonylmethane, Bulking Agent (Microcrystalline Cellulose), Bromelain, Anti-caking Agent (Magnesium Stearate), Silicon Dioxide, Tablet Coating (vegetable protein). Take 3 tablets daily with food or 6 tablets if required, or as professionally directed. Do not take if pregnant, planning a pregnancy or breastfeeding. 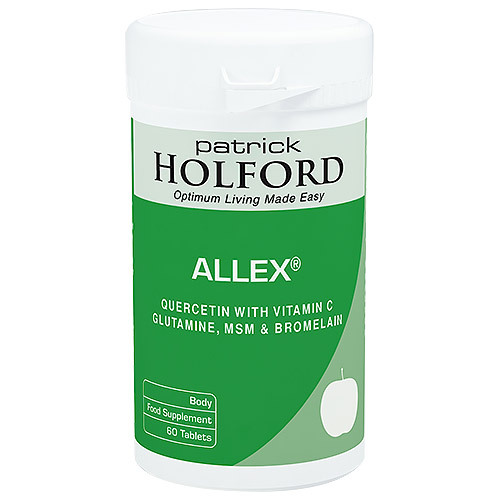 Below are reviews of Allex - Immune Support - 60 Tablets by bodykind customers. If you have tried this product we'd love to hear what you think so please leave a review. There are certain times of the year when the immune system may require extra nutritional support. For example in certain seasons pollen or environmental factors can place extra pressures on the nutritional requirements of both adults and children.